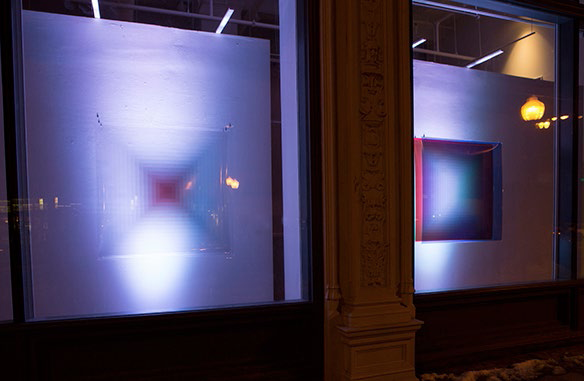 Degrees of Lightness, Diptych, three layers of transparency film, color lighting, 42” x 42” x 10”, Luftwerk 2015. By overlapping three separate gradients of red, blue and green Degress of Lightness reveals grey-scale. Color changing lighting illuminates and shifts the spectrum of each color hue. Lights On Tampa 2015 is about connection: Connecting people to place, place to the arts, the arts to people. Art and technology are both avenues in which many things travel. Both are direct extensions of what we are and where are as a city. Recognizing that culture and innovation emerges from the community, Lights On provides a foundation for exploration of ideas and put them in the spotlight. 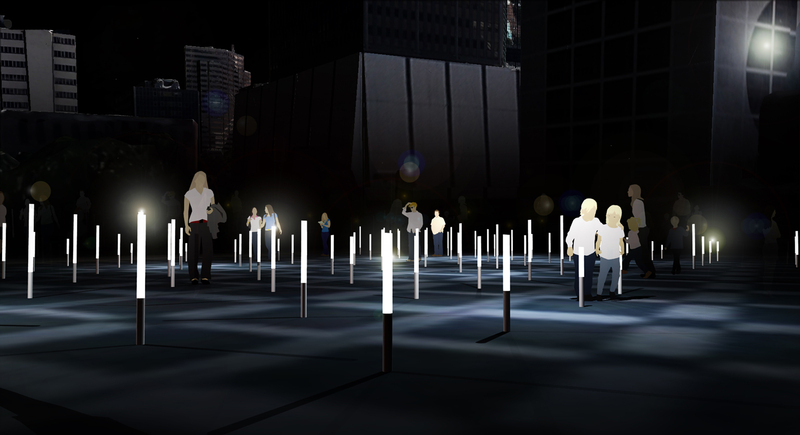 The 2015 event was taking place two consecutive nights: February 20th and Saturday, February 21st, 2015 from 6:00 – 11:00 p.m.
Luftwerk presents Recurrence – a light art installation that evokes the tidal flow of the Hillsborough River through programmable kinetic LEDs. This elegant artwork was comprised of a grid of lights that flowed in a compressed rhythm to the tides of the Hillsborough River.